The Thompson Okanagan Region was officially certified as the first destination in the Americas to have successfully achieved the Sustainable Tourism Accreditation from Biosphere International and the Responsible Tourism Institute. In April 2018, the Thompson Okanagan Tourism Association was named this year's winner of the prestigious Tourism for Tomorrow Destination Award during the World Travel and Tourism Council Summit in Argentina. These Awards recognize and celebrate inspirational and world-changing initiatives in tourism taking place all over the globe. We have taken our accreditation a step further and have initiated a program to identify and feature responsible tourism providers in the Thompson Okanagan. These businesses have committed to our guidelines and support the region’s growth and sustainability for the future. 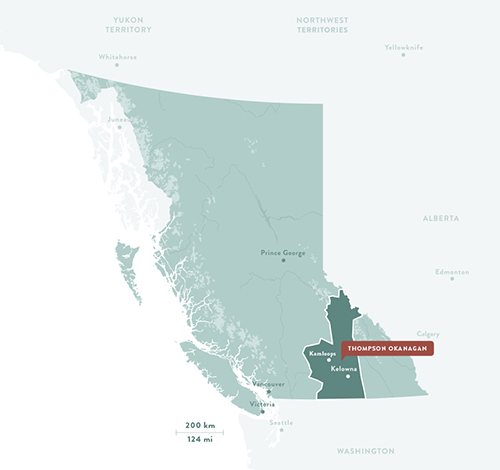 Nestled in the Southern Interior of British Columbia, Canada, the Thompson Okanagan is a diverse area covering approximately 71, 600 km² / 27,644 mi², roughly the same size as Ireland. Home to over 90 communities and over 200 licensed wineries, the landscape is as varied as the tallest peak in the Canadian Rockies to the semi-arid climate of the Okanagan Desert. It is a region rich in Indigenous culture, sun-soaked valleys surrounded by sweeping grasslands and connected throughout by water. Adapting our travel behaviours goes a long way in preserving our natural environments and cultural treasures while also positively impacting economies. If we all do one small bit it adds up to a whole lot.